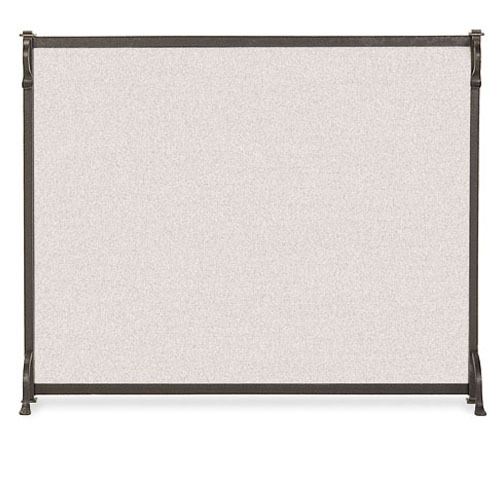 * Please Note: The listed screen size refers to the framed mesh area and does not include feet or decorative finials. Also, because this product is hand-forged, it may vary slightly from the dimensions provided. Please allow for an eighth-inch tolerance. Beside providing protection from flying embers, fireplace screens personalize your hearth. You'll love the classic design and vintage iron finish of this single panel fireplace screen. Pilgrim provides durable steel construction and a limited lifetime warranty on this product. The approximate dimensions are 39" wide by 31" high. So, if it's time to update your hearth, or provide added protection for your family gatherings around the fireplace, check out this beautifully classic fireplace screen manufactured by Pilgrim. Although the screen does look very good, it seems to be a little less sturdy than I would have wanted. It leans slightly.